I have hinted at this a number of times, but I have written an eBook on my weight loss journey! You can order the book here for just $2.99. I wrote the book as a way to communicate how I lost 300 pounds. It's the most asked question to me these past five years, but it's an answer that needs more than a sentence. It's a difficult answer, after all, losing 300 pounds is not simple. However, I also feel one way folks go wrong about trying to lose weight is to copy-cat specific diets and recipes. I believe we all have our own tastes and we all have to find our own ways to cut back on eating and exercise more. But I also believe there are universal ways that everyone can lose weight. 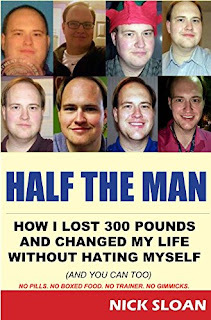 When I was writing the book, I decided to make it about lessons I learned while losing weight. I have put them in this book. Consider it a blue print on what ANY ONE can do to lose weight. These are not hard. These are not rocket-science discoveries. 1. Stop denying you have a weight problem. The first step in solving any problem is recognizing you have one. If you don’t feel like you have a problem, it will not get fixed. Stop denying it - everyone can see it and you can feel it. Recognizing the problem is the first step in you WANTING to address the problem. 2. Make a list of reasons you want to lose weight. The big thing about weight loss is finding the reasons you want to lose weight - and preferably - not just for health reasons. Health is important, but you should put yourself in the mindset of wanting to lose weight, not having to lose weight. When you want something instead of needing something, you are far more likely going to achieve it. Write this list down and keep it somewhere. 3. Set specific and challenging goals. This one is simple and does not really need to be explained. If you set goals, you become more motivated to reach them. 4. Stay happy. One of the biggest reasons I have succeeded most of these past five years, compared to previous efforts, was because I realized I could not hate myself on this journey. Weight loss is stressful enough - don’t add to it. This includes finding ways to make exercise fun and easy. It also includes not giving up your favorite foods. It includes not forcing yourself to do things that you feel like you need to do. Weight loss is not about starving yourself. It’s about finding the things not to eat. 5. Weigh yourself on a daily basis. Buying a scale and weighing yourself keeps you accountable to yourself. It also opens your eyes to what you are doing right and wrong. And once you start seeing progress, you will be motivated even more and continue on the journey. 6. Make yourself accountable to everyone. The scale keeps you accountable to yourself. However, if you set expectations for those around you, you will want to reach them. If you’re on social media, use it as a tool of accountability. Post before and after photos. Post photos that might make you feel humiliated. Post your weight totals. Whatever. 7. It’s a process, not an overnight success. It’s a lifetime journey and you need to realize that. It’s mathematically impossible to lose more than one pound in a day. You are doing something very unhealthy if that’s the case. Because of this, it’s important to realize you need to do baby-steps in both dieting and exercise. Don’t do the hardest exercise right away. Walk, don’t run. When it comes to eating, don’t go cold turkey on every single thing yet. 8. Prioritize what you eat. If you a responsible person when it comes to money, this should be an easy comparison to see. When you plan out a budget, you have to prioritize your spending. You have to pay the bills and only buy the things you can afford at the time. The same applies to eating. If you don’t eat wasteful calories - I’m talking that extra bowl of cereal, the extra doughnuts or the liquid calories - you can still eat most of what you enjoy now. You don’t have to starve yourself. You don’t have to get stuck eating veggie burgers, tofu or any other food you don’t want to eat. Also, if you’re in journalism, think of it as editing. You get rid of the “fat” and preserve only the necessary content. 9. You can be flexible with your diet. You don’t have to eat the same thing over and over again. This creates boredom. Many “diets” work, whether you are watching your carbs, calories or both. Don’t be afraid to mix it up once in a while and try mini-diets, a month or two of doing something different. 10. Win the Day. Each day matters. In order to hit the long-term goals, you need small victories along the road. Whether it’s losing 0.2 pounds in one day or saying no to a craving, savor all of your little victories. 11. Not everyone will love your weight loss efforts. Most will cheer you along the way. Some will not. Remember, this journey is FOR YOU. Not for them. For you. Don’t let the haters get you down, but you let them get to you, try to explain why you’re doing what you’re doing. 12. Bad days and stretches will happen. While you need to focus on “winning the day,” understand that bad days will happen. One day you will feel sick and not workout. Another day, say Thanksgiving, you will eat until you drop. You might have a bad week when you put on a pound or two. But don’t let the bad days pile up or discourage from going along. In every journey, there’s a bump. With weight loss, it’s no different. Just be prepared and be ready to survive the bumps. 13. Reward yourself in some way. This doesn’t have to be a “cheat day,” though I do one once a month because I can cut down my cravings now. I have self control of my life. It feels good. For you, maybe it’s buying a pet. Or a vacation? Remember, this journey needs to be about wanting to lose weight, not “having to” lose weight. Pat yourself on the back when you deserve it. 14. Do it your own way. One of the big mistakes I made on previous efforts to lose pounds was to try to change who I was. I tried to become “protein shake guy.” I even tried to become “vegetarian guy.” I tried to be organic food guy. But while there is nothing wrong with doing that, that was not who I was. I hated myself and did not enjoy those diets. I discovered that I was able to maintain who I was while losing weight. I still eat meat, red, white or pink. I enjoy tacos, though I try to cut down on the chips. I still enjoy eggs and bacon. I still enjoy sugar-free jello. I enjoy putting cheese on my vegetables. By being able to prevent myself from overeating and making every item of food I ate count, I still enjoy most of the eating I was able to do. 15. Healthy living doesn’t have to be expensive. For the first 28 years of my life, I bought into the idea that being healthy was unaffordable. I thought gyms were too expensive. I thought healthy food was too expensive. Both of those thoughts were wrong and the idea that losing weight is too expensive is just an excuse to be unhealthy. Don’t buy it. For vegetables and fruit, by frozen. Don’t eat out too often. Buy certain cuts of steak and chicken that might be a little more affordable. Do eggs and bacon, one of the cheapest and most delicious breakfasts you can do. And by the way, eating less food will save you money anyway. 16. Emotional eating will only make you more emotional down the road. Just as it’s a myth that smoking relaxes you, it’s a myth that eating will make you feel better emotionally about yourself. Eating two doughnuts instead of one or preferably none will not make you happier. If you become happier, it wasn’t because of a jelly doughnut. That ice cream sundae didn’t make your day better. Point is, if you eat too much because of emotion, you are only guaranteeing more emotional problems down the road. As you grow fatter, you become less confident about yourself. Emotional eating or eating because of stress will only guarantee more emotional breakdowns and more stress down the road. It’s not worth it. 17. More food, less calories. If you find it hard to immediately cut down on the activity of eating, you don’t have to necessarily eat less to lose weight. You only have to lose less calories. A McDonald’s McFlurry dessert approaches 700 to 800 calories depending on your preferred topping. Two cups of macaroni and cheese will put you 600-630 calories in the hole. A couple of eggs and a couple pieces of bacon are around 300 calories. You can eat three cups of cheese and cooked broccoli for about 135 calories. You need to do a little math, but you keep an eagle eye on the labels, you can make this happen. You can eat more and still lose weight if you find the right calories to cut out and the right food to eat. 18. It’s all worth it. Simple as that. 19. It’s about wanting to lose weight, not feeling like you have to lose weight. Again, this is not to diminish the health benefits you will receive once you drop a lot of weight. It’s about the social and attitude benefits of losing weight. You feel better about yourself. You are more confident about yourself. You are no longer embarrassed about being the only fat guy at the table. You no longer have to hide while shopping for larger clothes at the Big & Tall section of a store. It’s not feeling uncomfortable when sitting on an airplane or train. It’s the easier ability of walking up the stairs. It’s feeling like you can flirt with a woman or a guy. The health reasons are important alone, but if you let it become the only reason, you will fail. You need to find all of the benefits of wanting to lose weight. Once you do, you will realize the extra food isn’t worth the value of those long-term benefits of getting healthier.